There’s no doubt that late spring and summer are the most popular seasons to visit Niagara Falls — and we definitely understand why: The weather is gorgeous, the falls are at their thundering peak, and everyone has a at least few days off to explore our magical region. Spring and summer are fantastic times of year to enjoy the falls. Yet, what we don’t understand is why fall isn’t nearly as popular as the warmer months. Though temperatures do begin to drop, the weather remains mild and comfortable. Only during fall can visitors see the Niagara Valley set aflame with stunning reds, oranges, and yellows of autumnal trees. Plus, the region continues to offer unmissable events. If anything, Niagara Falls in the fall is an even greater experience than spring and summer — and we’ll prove it to you with this list. Niagara Falls itself is undoubtedly the main attraction that brings travelers to the region. During fall, the thundering waters continue to be a sight worth seeing — and they are made even greater by a halo of fiery trees changing color for the season. Simply put, anyone who misses exploring Niagara’s outdoor spaces during autumn is missing the full, gorgeous, Niagara experience. There are several natural excursions that will lead you directly into Niagara’s autumnal heart, and most are walking distance from your centrally located Niagara Falls hotel. For example, Dufferin Islands is a cluster of stunning islands connected by paths and footbridges, located just a half-mile south of the falls. Though the free-to-enter park is teeming with people during the tourist high season, during autumn, the islands are quiet and secluded. Additionally, the SkyWheel and Skylon Tower in Clifton Hill provide birds-eye views of the region surrounding the falls, so you can see all of Niagara aflame with fall color without venturing too far from tourist delights. Though Niagara Falls — and the entire Niagara region — enjoys a much milder fall and winter than neighboring states and territories, you should prepare for lower temperatures if you plan to explore the outdoors. As one of Niagara’s driest seasons, fall doesn’t necessitate any rain or snow gear, but you should come equipped with light layers. Even if you aren’t an outdoorsy person, there is much to enjoy about Niagara Falls in the autumn. Niagara’s fertile soil demonstrates its power during the October and November harvest. At restaurants, wineries, and other venues around the region — including festivals like Niagara’s Oktoberfest and the Fall Handmade Market — you can enjoy the freshest food and beverages imaginable all season long. Additionally, both Canadian and American Thanksgiving celebrations occur during the fall, meaning you have at least two opportunities to enjoy feasts with fellow travelers, family, and friends. Plus, you can enjoy tributes to other beloved artists, including Tragically Hip, the Beatles, Pink Floyd, the Rolling Stones, Supertramp, and Elton John. You can easily bounce from venue to venue for the rest of autumn and experience a lifetime full of performances in one season. 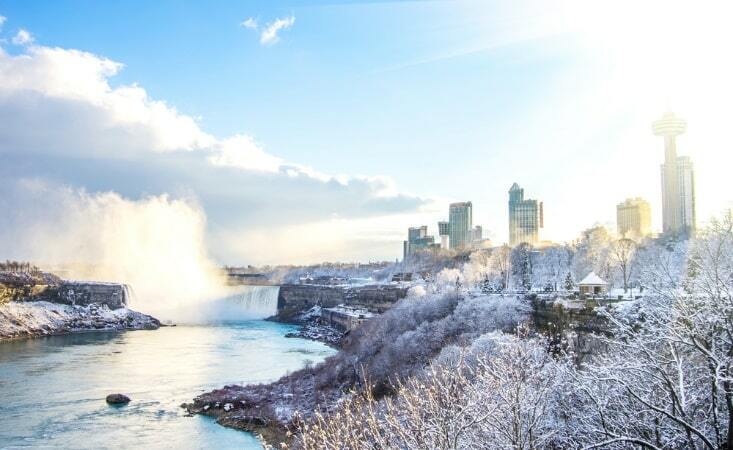 Toward the end of fall, Niagara begins transforming into a winter wonderland. As the calendar inches ever closer to the winter holidays, seasonal touches begin appearing around the Falls. For example, Dufferin Islands become festooned with dazzling lights, making them an utterly magical setting for a twilight stroll. Every year, there is at least one Santa Claus Parade, when the big man himself spends time in Clifton Hill. Additionally, if you save your trip for the very end of autumn, you can experience the splendor of the Winter Marketplace, where you can buy Niagara gifts to surprise your loved ones who couldn’t travel with you. The promise of winter is half the fun of fall, and because Niagara Falls is enchanting in the cold season, too, you should consider enjoying the best of both worlds with a late-autumn vacation. 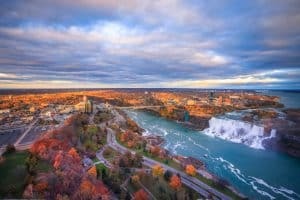 While major attractions like the changing foliage or the unique shows might bring you to Niagara in the fall, minor joys will help you fall in love with the area in this season. There is something terrifically charming about seeing pumpkins and scarecrows everywhere you look; you can even find at least one corn maze in the farmlands and orchards surrounding Niagara Falls. Plus, it is only during fall that you can enjoy the sweet, warm sensation of pumpkin spice at Canada’s seminal coffee shop, Tim Hortons. If nothing else is putting you in the autumnal mood, a trip to Niagara Falls certainly will.